Carters Barn Farm is set in an ‘An Area of Outstanding Natural Beauty’ our rolling countryside boasts spectacular views, nestled on the edge of the Piddle Valley. The Granary and Teals Den are our delightful holiday cottages, positioned along a private lane with an abundance of trees, hedges, fields of crops and wildlife. The area is fantastic for walkers, cycling, bird watching, and horse riding. There is fabulous Fly Fishing, and great sea fishing nearby. There are plenty of other water based activities, including, sailing, canoeing, paddle boarding, with fabulous facilities at the Weymouth Sailing Centre (designed for the Olympics) and many more, all within easy access. 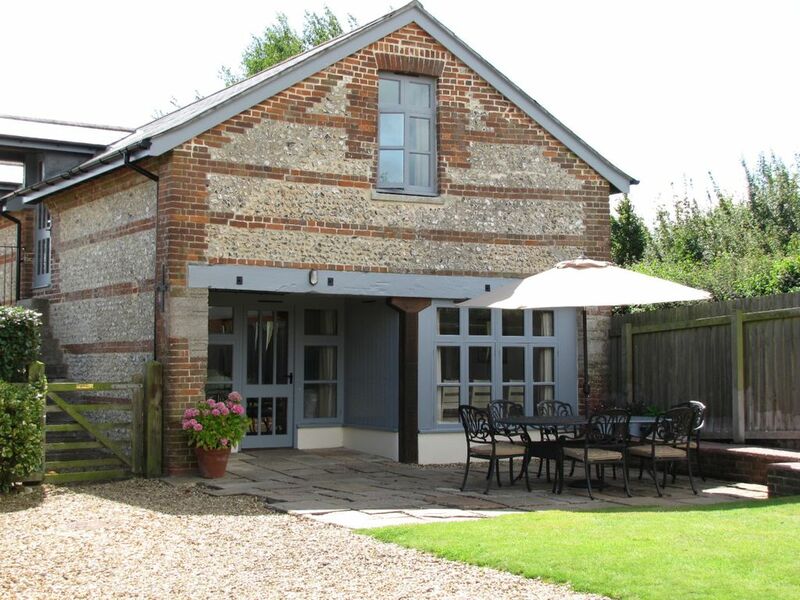 The Granary is a four bedroomed barn conversion, which has been lovingly restored to provide luxurious, home from home accommodation which can accommodate up to eight people. It is the perfect venue for Family Holidays, Shooting parties, Horse Riding Groups, Walking and Cycling. There is an enclosed private garden with patio area, which is ideal for barbecues and an area of lawn where children can play safely. All the rooms are of a large size, the stunning lounge has a working Wood burner, for those chilly evenings, plenty of comfortable sofas and armchairs to relax of an evening. Our Kitchen/Diner is large and easily accommodates eight people, with the breakfast bar providing extra seating for two. A large American style fridge/freezer, Double oven and halogen hob. A grand Master bedroom with an impressive ceasar size bed, TV, ensuite and plenty of cupboard space. A twin room with two single beds and TV. A further kingsize bedroom with TV and plenty of cupboard space, lastly a cosy bedroom with bunkbeds. Teals Den has one double bedroom, a spacious open plan kitchen/diner/lounge, which has the benefit of a sofa bed, allowing the property to accommodate a further two guests. There is a utility room with a dog’s bedroom. Dogs are welcome to ‘Teals Den’, at our discretion. This is a cosy retreat, which would be perfect for a romantic weekend, or a honeymoon! Or just, as a holiday venue. You are more than welcome to book both properties at the same time, should you wish to book a larger party. Both cottages provide all the comforts of home, ensuring you will have all you will need to make your holiday a truly relaxing experience, for families, couples and friends seeking the peace and tranquillity of the Dorset countryside. There are a choice of excellent Pubs and Inns for wining and dining in the local villages of Piddlehinton, Piddletrenthide, Buckland Newton, Plush and Cerne Abbas. Some of which are within easy walking distance of the accommodation. Our holiday cottages are part of our private working farm. Please be aware, at times you may hear some noise associated with the work that is being carried out on the farm. We can also offer accommodation for horses, (at an extra cost), should you wish to have a riding holiday in the area. Our Equine facilities are top class, we have a large outdoor Ménage, stables (American Barn Style), and superb grazing. There is no immediate road work from the farm, you are straight onto miles of Bridle paths, whereby you can explore the beautiful Dorset countryside! Please do not hesitate to contact me for further information. Whatever the size of your party and whichever holiday cottage you may choose, we are confident you will have a memorable holiday in beautiful rural Dorset. My husband and I have lived on our farm with our two beautiful daughters for the past 7 years, we have run one of the holiday cottages on the farm for the past 4 years. We are very excited to announce that we have just opened a second holiday cottage, (Teals Den) on the back of the success of The Granary! I have lived in Dorset for all of my life. My husband originally came from Oxfordshire, he moved to Dorset 15 years ago and runs his families 6th generation farming business. We both share a passion for the countryside and everything it has to offer as well as the outstanding coastline around Dorset. As a family we love to spend the weekends around the farm, either walking our dogs, running, cycling and horseriding. Our girls both love the fun and freedom of the farm, equally they look forward to trips to the seaside where they both love to make sandcastles! In the fields around the property, you will hear an abundance of birds, including seeing Buzzards soaring in the sky, and nesting swallows. Deer are frequently spotted, as well as Foxes and Badgers. We also think that the local Bunnies love our home as well, we seem to have hundreds of them! You will always catch them hopping up our lane. This whole area is truly an unspoiled corner of England, so it is no surprise that we welcome guests back year after year to escape and unwind. All this makes our Cottages quite unique, the peaceful, spacious, rural location, so much of interest to see and do. Literally, hundreds of beautiful villages to explore. Fabulous country houses to explore. Our list is quite endless, so we look forward to welcoming you and yours to the Piddle Valley, the ‘Jewel’ in Dorset’s Crown. 2 Bathrooms, 1 separate Toilet Main bathroom with shower over bath, washbasin and WC; En-suite Sower room to Master bedroom, double sized shower, washbasin and WC; Downstairs WC with washbasin. Bed linen is provided, if staying for more than 7 nightsplease contact me as a mid-stay linen change can be arranged. Unlimited BT broadband and WIFI included. Bath towels, Hand towels and face towels are provided. A complimentary soap and hand lotion are provided as part of the welcome pack. Wood burner A basket of wood is suppled on arrival, please contact me if you would like more wood at an additional cost. Fridge freezer, dishwasher, microwave, kettle, toaster, halogen hob. Dining area with large wooden table, seating for 10 guests, plus high chair. Breakfast bar and breakfast stools, seating for 2. Childs high chair Dining Comfy seating for 10 plus an extra two bar stools at the breakfast bar. Large hall with storage cupboard.